Set of 7 different patterned sleeves, with unique illustrations. To make pysankas, all you need are these heat sleeves, eggs and hot water, and you'll get a beautiful pysanka in 3-5 seconds. (instructions included). Place the wrapped egg on a spoon and dip it into boiling water for 3-5 seconds. The film will shrink around the egg. Open each sleeve and slip this cylindrical film over a boiled egg. Cut film into the 7 separate sleeves. Used for Easter egg DIY, you can paint on the eggs. 1x 20PCs Empty Easter Eggs. Pencil, crayon, water color, gouache can be painted on the eggs. Material: Plastic. pealse be aware of this before placing your order. 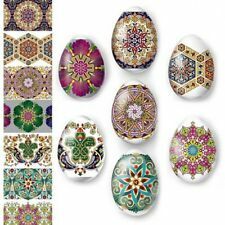 This set of Easter eggs is a superb decoration for many thematic celebrations and Easter occasions. 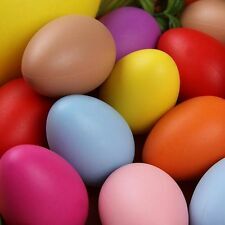 12pcs eggs in assorted colors. Easter eggs can be filled with surprise toys to give children a big surprise when they get the toys. Use your expert hiding skills because these Colorful Bright Easter Eggs won’t be easy to keep out of sight. Each half of these plastic eggs is attached by a hinge, so even after you open them, they remain intact. Rough surface, available pencil, crayon, watercolors, gouache and other coloring. Above the small hook finished painting can be suspended. Product Specifications: 6.3 4.5 (slightly larger than normal eggs). Very good condition. No cracks. This exquisite needlepoint features a lovely boy with rabbit. and lettuce in a garden with sun setting in back ground. 23" wide 27" tall. Weighs 8 lbs. so it's a pretty heavy. I was able to get one in a photo. We believe the other ones to be from Dennison - but we are not sure as they are unmarked- it is a really neat lot. Antique 1800s. Easter Egg. Victorian Blown Glass. Egg Has Flat Bottom So It Sits Nicely. The Word Easter Is Embossed On Side. The Paint On EASTER Is Missing. There Is Missing Paint On The Cross And Flowers. 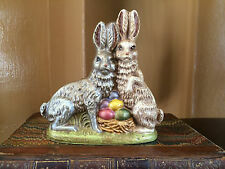 Gorgeous Hand Painted Large Ceramic Bunny Rabbit Figurine; Estate Find; VGC!!! Acquisition #1038. We are always happy to answer your inquiry to the best of our ability. This is an estate find of unknown age or provenance past it's last owner. This piece is NOT perfect. We don't proclaim it to be. Hallmarked on the bottom as shown in close up pics. Otherwise very detailed, in excellent condition. 60 EMPTY PINK PLASTIC EASTER VENDING EGGS 2.25 INCH, BEST PRICE, FASTEST SHIP!! GREAT ITEM, FILL THEM FOR VENDING OR OTHER USES. 60 EMPTY PINK EASTER EGGS. 60 EMPTY PINK COLOR EGGS, 2.25" LONG, 1.5" WIDE. Double your traffic. Beautiful stained glass character from Beatrix Potter 9"T x 6"W.
Antique Rare FindUnique Ceramic Rabbit Eatting Lettuce Square Ears Big Brown Eyes. Condition: excellent condition for age small crazing hardly noticeable over right foot see photo #1. Gifts for everyone: Clothes, Purses, Toys, Collectibles, Military, Jewelry, Books, and Pet stuff. Bunnies holding ribbons around the Maypole. Whimsical Easter serving display platter designed with. Style: Serving Platter. Pattern: Easter. Color: Multi-Color. 20 EMPTY PINK PLASTIC EASTER VENDING EGGS 2.25 INCH, BEST PRICE, FASTEST SHIP!! GREAT ITEM, FILL THEM FOR VENDING OR OTHER USES. 20 EMPTY PINK EASTER EGGS. 20 EMPTY PINK COLOR EGGS, 2.25" LONG, 1.5" WIDE. Double your traffic. Condition is very good for the age with a little expected paint loss. and traces of use. 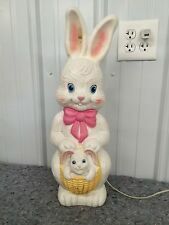 Cute ceramic Easter Bunny. Fired to cone 4 and ready to paint. Pristine Stephan Baby quality flop-eared bunny for your little one! Soft and lovable - ready to make a child his cuddly friend. Mint pre-owned condition. Cute long bunny ears and perfect sheer ribbon bow. These can be used indoors or outside. Garden Rabbit - Set of 2. The gilded bowl bears the word"Easter" in Old English lettering. This rare and unusual item remains inexcellent antique condition and bearsno monograms. marik urnn A25 4039 4049. This a set of 17 different color dyes, used for making pysanky or Easter Eggs. Colors: royal blue, pumpkin, purple, pink, dark green, brick, brown, dark red, orange, turquoise, gold, scarlet, light green, light blue, yellow, black and red. 40 EMPTY PLASTIC EASTER VENDING EGGS 2.25 INCH, BEST PRICE, FASTEST SHIP!! GREAT ITEM, FILL THEM FOR VENDING OR OTHER USES. 40 EMPTY PLASTIC EASTER EGGS. 40 EMPTY ASSORTED COLOR EGGS, 2.25" LONG, 1.5" WIDE. Double your traffic. BUNNY RABBIT DUCKS WITH HATS KNICKERBOCKER. PRIMITIVES BY KATHY. WHITE colored SHEEP made of WHITE COTTON, slightly. goes DOWN to the MOUTH. The BLACK SHEEP is made of. the WHITE SHEEP have BLACK HOOVES and Distressed. EASTER - SPRING. There are 5. 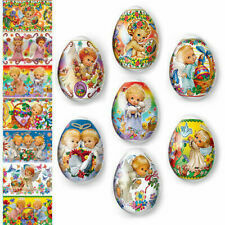 Easter 157 9 Pieces Basket Style. with flowers Egg Stand or Holder. Midwest Cannon Falls Collectible. MATERIAL: Cold Cast Resin - Hand Painted. Cute & Colorful! They look great and add a touch of Spring. Faux Chocolate Foil Male Bunny Rabbit Standing Figure Easter Traditional 19"
Hi! Welcome to Weaim2pleez. Here is a Faux Chocolate Bunny Rabbit. Measures 19" tall. Bunny holds Easter basket. BRAND NEW! BUY IT NOW!! . This 2-1/2" long by 2" wide white egg has an orange and yellow embossed chick and matching embossed letters spelling out "Easter". 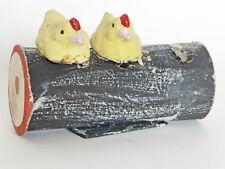 There is wear to the color on the chick and the words "Easter" as shown in pictures. It has colorful flowers that are all fiber optic and a bunny is laying inside under his blanket. I do not have expertise in all areas but have tried to describe this item to the best of my knowledge, observance and ability. Vintage Easter Bunny Paper Mache Composition Brown w/ Drum Germany ? 5"